If you are planning a trip and need travel insurance for unexpected costs you may incur such as lost baggage, medical bills or even hotel expenses; it may be hard to know how to choose one company over the next. This is where a travel insurance comparison website like TravelInsurance.com can make this job easier for you. TravelInsurance.com is a relatively new travel insurance comparison website owned by DigiVentures Holdings, LLC, which is a digital holding company that has its hand in a number of web businesses in various industries. DigiVentures was founded in 2009. TravelInsurance.com is headquartered in New York, New York. The co-founder and company principal, Drew Sharma, founded the company in 2011. Even though it may have not been around as long as some of its competition, TravelInsurance.com is considered a top player in the travel insurance industry. It has been a Better Business Bureau accredited business since 2012 and holds an “A+” rating with the organization. There are no complaints against the company filed. Of course, there is not a very long history to look back at but this still speaks highly of the company’s overall customer satisfaction level. The company is a member of the US Travel Insurance Association (UStiA) and has a 4.7 out of 5 overall customer satisfaction ranking with Shopper Approved, an online customer rating site that gathers company ratings for companies in various industries across the nation. In fact, 97 percent of the customers participating in the ratings said they would recommend TravelInsurance.com to a friend. Through TravelInsurance.com, you can get a quote for travel insurance through a number of the site’s trusted insurance company partners including Allianz, RoamRight, CSA Travel Protection, Travel Insured International, Travelex, VacationGuard and Travel Guard. The website also provides customers with other helpful features including a learning center, travel tips and a claims assistance center. A claims assistance center is available to help if you have trouble having a claim paid with any of the site’s insurance company partners. All of the claims contact information for each travel insurance company is available here for you. TravelInsurance.com offers insurance comparison for groups of 10 or more who need group travel insurance. It is an ideal solution for those who frequently travel is groups whether it is for work related trips, volunteerism, study groups, religious organizations, organized tours or other traveling groups. 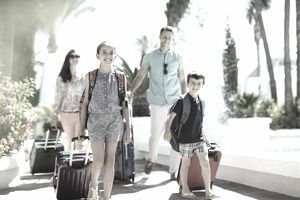 Group Travel Insurance works in much the same way as an individual plan; however, it covers the group (10 or more travelers) on the same policy. The general requirements for Group Travel Insurance are: 10 or more travelers; all travelers going to the same destination; and all travelers must be U.S. residents. One thing many people worry about when purchasing insurance online is the security of their private information shared online. TravelInsurance.com is a “Norton Secured Seal Trusted” site which has encrypted data transmission, meaning your private information is secured using a SSL Certificate. TravelInsurance.com is a relatively new player in the travel insurance industry but has an excellent reputation with top travel insurance company partners. It has an “A+” rating with the Better Business Bureau and a website that is easy to navigate. Customers give TravelInsurance.com top ratings in customer service and overall customer satisfaction. TravelInsurance.com provides 24/7 emergency customer assistance worldwide. This website is a good choice as a helpful tool for travelers looking to find the best value on a policy in the least amount of time. If you would like to shop for travel insurance and start comparing plans and rates, you can visit the TravelInsurance.com website or call 1-877-906-3950 between the hours of 9am – 8pm EST Mon-Fri. The company also has an online support live chat feature on its website where you can get help from a live agent.